By far the most popular type of financing we offer is our Single Family Fix & Flip Loans. These are short-term hard money loans for flipping houses that will allow you to purchase, renovate & repair, then sell (or refinance) a single family home. Typically these loans will cover from 65% - 80% of your Purchase Price, and up to 100% of your Renovation Costs, with the latter being released in draws as the work is completed. The Single Family Fix and Flip Hard Money Loan rates & terms listed below are subject to change, and will not apply universally. These are just rough ballpark rates & an outline of the typical terms. Min. Loan Balance: $70k - $100k, (click here for low balance (<$70k) hard money loans). Max LTV (Purchase Price): 65% - 80%, with up to 90%+ for highly qualified repeat Borrowers. While the rates, programs, and terms will vary on a case by case basis, Glassridge does our best to offer Loans for Flipping Houses that are accessible to all types of investors. Since it's such a popular type of private hard money loan, we have a wide variety of specialized fix and flip loan programs to meet your needs. Whether you need a Low Balance Fix & Flip Loan (<$70k), a High Balance Fix & Flip Loan (>$1m), or anywhere in between, we can match you with financing with the best rates & terms for your situation. Similarly, we also offer Single Family Fix & Flip loans to Borrowers with less than perfect credit through our Low Credit Score Hard Money Loan programs. For qualified Borrowers on deals that meet the criteria, we even have Low Doc and No Doc Fix & Flip Loans to help you close without all the hassles of additional paperwork. Finally, since we can not only broker loans nationwide, but also have private equity-backed direct loans available for Single Family Flips, we can close loans other lenders can't & get you better rates and terms. Our goal is to get you funding! Whether your priority is high leverage or low cost financing, all Single Family Fix & Flip Loans do share a few traits in common. First of all, obviously they are for short-term investors whose goal is to buy, add value to, then sell or refinance. To qualify as a true Fix & Flip loan, we're looking at a 1 year loan term, possibly up to 18 months max. 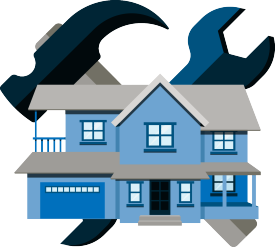 Finally, Fix & Flip loans all will have at least some of the "Fix" component: a renovation / rehab / repair budget. Note: For a short-term residential loan that doesn't require the "Fix" component, you might also check out our Residential Bridge Loan options. A high Loan To Value ratio means you're putting as little of your own money up as possible. Depending on location, track record, credit, and a few other factors, we offer loans up to 90% LTV & 100% of renovation costs. A low Loan To Value ratio means you'll be putting more skin in the game. This will help you get the best rates. We have several specialized Single Family Fix & Flip Loan programs that will save you a bundle if you keep the LTV under about 65% (depending on circumstances). The most important factor in your real estate fix and flip hard money loan will be The Deal Itself. ... ideally with the property already under contract when you're applying. If you'd like to get a clearer picture of particular your funding options, before actually putting in an offer & getting a property under contract, please feel free to fill our our quick, online 2 Minute Pre-Qual™ or simply contact us to discuss your situation.